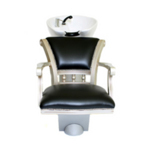 The Pompadour 2000 washpoint complete with a deep, white, italian, tilting basin with mixer tap, shower head and plumbing fittings all pre-fitted. 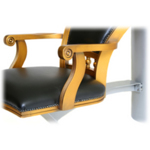 Silver base with a black chair and available with either gold or silver arm rests and spindles (please use the drop down to select). 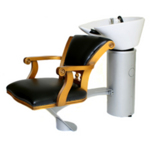 This elegant washpoint would be a perfect addition to any modern salon, with matching styling chair available Click here To View.